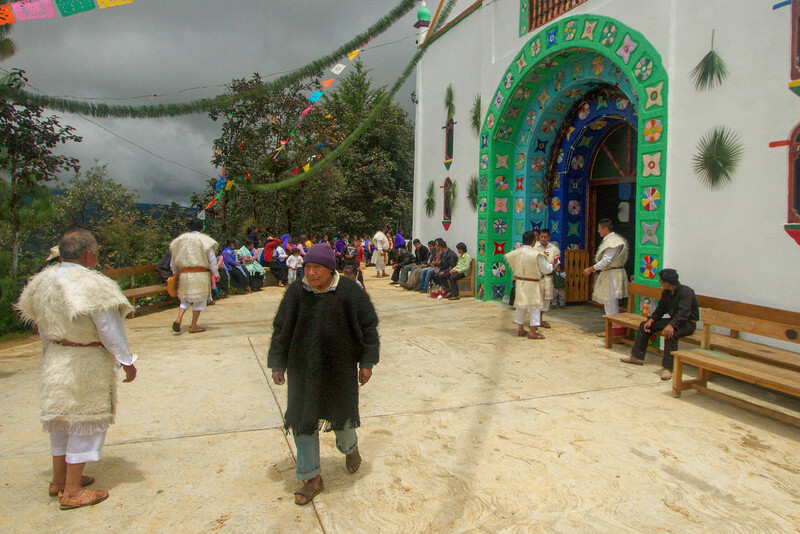 San Juan Chamula, Chiapas may be the most famous of towns where the indigenous Mayan ancestors live in Mexico, but there are many other villages throughout Chiapas where Mayan tradition and the Mayan people still survive. Chamulans are very protective when it comes to their traditions. For example, if you are caught taking photos inside of the San Juan, Chamula church you can get your camera smashed or you can even be jailed. This is something you don’t want, especially since the Chamulans have their own laws and police force. 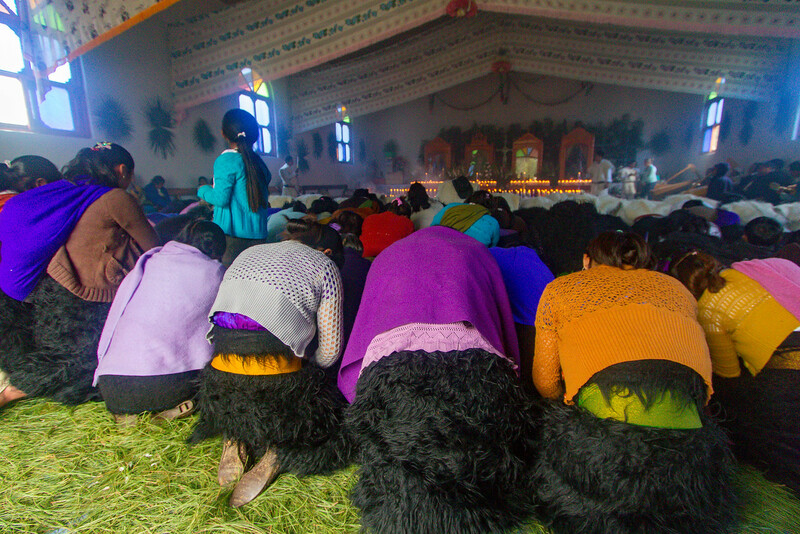 That is one reason why photos of Tzotzil Mayan ceremonies, inside a church, are so rare. Because I lived in San Cristobal de las Casa, Chiapas, a town ringed by Tzotzil Mayan villages, I had many opportunities to visit these traditionally Mayan areas and get to know some of the people who lived there. In one village, Nichnamtic, I was invited to bring my camera and take pictures inside a Tzotzil Mayan Chamulan Worship Service; a very rare opportunity. I was even able to befriend the Mayan shaman, a modern Mayan priest, who allowed me to follow him around while he arranged and directed things. It is all very confusing and no one, not even the participants or experts, can agree on the details of how these modern Mayan celebrations evolved into what I was seeing today, but as it was roughly explained to me: 1867 the indigenous peoples, the Chamulas, got fed up and expelled the last of the Catholic priests from their parishes and began practicing a new religion, a mixture of old pagan rituals, Mayan ceremony, and Catholicism. Inside the church there are no altars, there are no pews and the floor is covered with a carpet of pine needles. 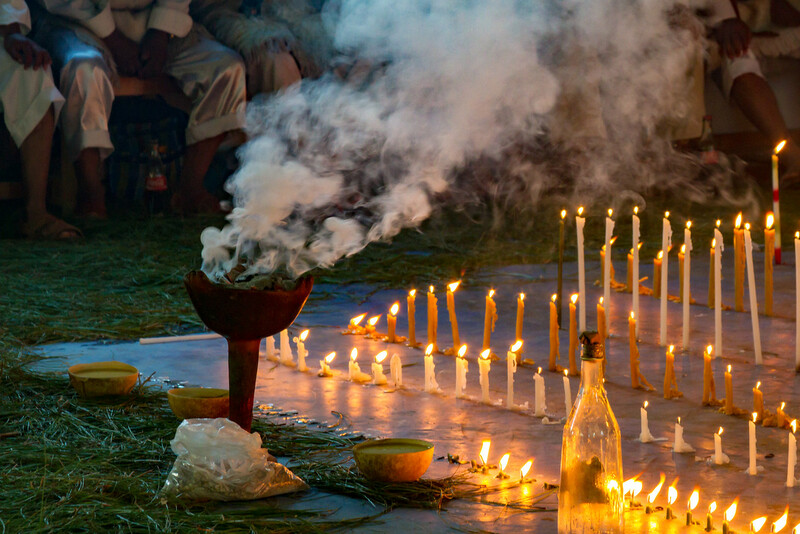 The air is thick with the billowing smoke created from pine resin incense (copal) heated on charcoal. Elders, directed by the Mayan shaman, keep a staircase of candles burning so that the dead may climb into heaven. Along the wall are glass cases, each containing the likeness of a saint who while once Catholic, are now worshiped as Mayan Gods. The saints are adorned with small mirrors to help redirect spirits back into worshiper’s bodies lest they escape during a trance. Huge quantities of food are consumed on behalf of the saints who, as a reward, will then send rain for the crops. Large quantities moonshine, cigarettes, beer and Coca-Cola are consumed; the latter presumably to create big belches that expel evil spirits from the body. 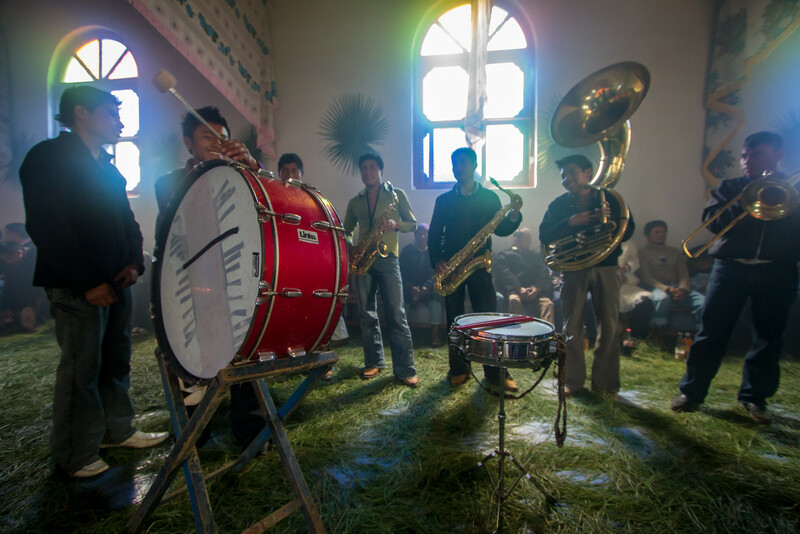 A brass band plays, bells are rung, and ritual dances are performed. I didn’t understand much of it, but I, along with everyone else, was having a good time. When I left and went outside, the shaman’s assistants were launching homemade bottle rockets, from their hands, also to help summon thunderstorms to water the crops, similar to the way the Buddhist in Laos launch rockets to help awaken the rain gods. 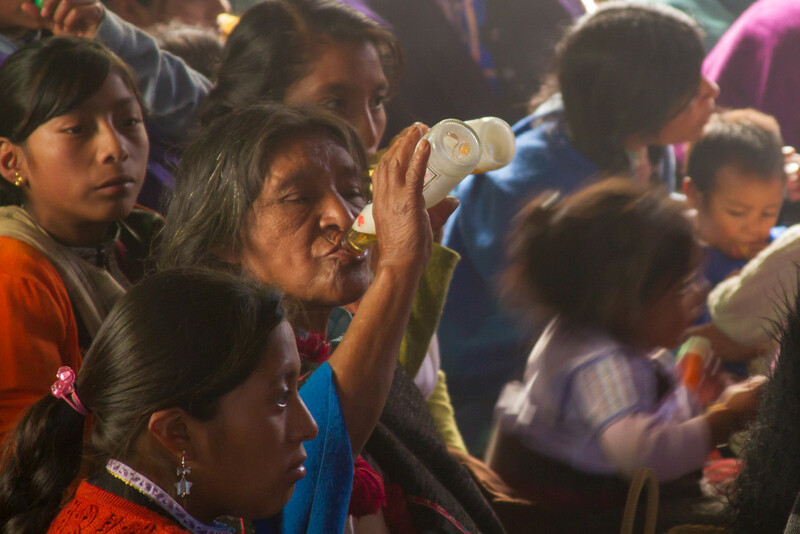 This was a rare glimpse into the traditions of the modern Tzotzil Chamulans as well as some Mayan celebrations. Again, I can’t believe how fortunate I was to be given this opportunity to photograph inside a Chamulan Church during a ceremony. You can see more photos of this modern Mayan celebration inside the church here.